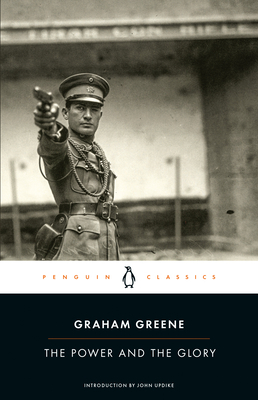 Seventy-five years ago, Graham Greene published The Power and the Glory, a moralist thriller that traces a line of influence back to Dostoyevsky and forward to Cormac McCarthy. Named one of the 100 best novels of the twentieth century by Time magazine, it stands today as his masterpiece. Mexico, the late 1930s: A paramilitary group has outlawed the Catholic Church and been executing its clergy. Now the last priest is on the run, fleeing not just an unshakable police lieutenant but also his own wavering morals. As he scraps his way toward salvation, haunted by an affair from his past, the nameless “whiskey priest” is pulled between the bottle and the Bible, tempted to renounce his religion yet unable to ignore the higher calling he’s chosen. Timeless and unforgettable, The Power and the Glory is a stunning portrait of both physical and spiritual survival by a master dramatist of the human soul. JOHN UPDIKE (1932-2009) was the author of more than sixty books, including collections of short stories, poems, and criticism. His novels have been honored with the Pulitzer Prize (twice), the National Book Award, and the Howells Medal of the American Academy of Arts and Letters. Hugging the Shore, an earlier collection of essays and reviews, received the National Book Critics Circle Award for criticism. He died in January 2009.